Kate Locke continues to dazzle readers with her spunky, fierce heroine, Xandra Varden. 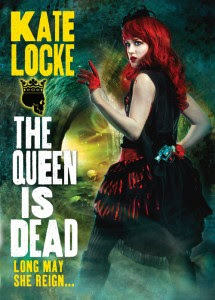 The Immortal Empire series began with God Save the Queen where Locke introduced readers to an alternate world where England is still under the rule of Queen Victoria, and she's not human. In fact she's one of the plagued, supernaturals with the blood of werewolves, vampires, or goblins. Xandra learned shocking truths that changed her view of her family and of the Aristocracy, the people she believed, as a half-blood, she was born to protect. Now that Xandra knows that she is actually a fully plagued goblin, she has to choose whether she'll officially accept their crown or walk away from it all. The Queen is Dead is just as fascinating and fantastically cool as God Save the Queen! As readers are guided deeper into Xandra's world the more intricate it seems. There are many secret plots afoot and Xandra stumbles upon them as she searches for her missing brother. Val was investigating the disappearances of half-bloods from Freak Show, but taken when he came too close to the truth. It takes all of Xandra's resources, which included enlisting the help of her goblins, to wade through the deceptions put forth by the Aristocracy. After the death of Xandra's younger sister, Dede, life hasn't gone back to normal. Xandra has separated from her brother and sister, living alone in a mostly human neighborhood. Even there she's targeted by the Human League and the press; the public is afraid of the Queen of Goblins. The one constant in a life in which normal is no longer definitively defined is Vex MacLaughlin, but even Xandra's burgeoning relationship could be pushed past its limits. Vex's wolves are pushing for a political alliance with the goblins. Even Xandra's mother, Juliet, is pushing for an alliance with her faction of rebels. Xandra's mother is another aspect of The Queen is Dead that makes it even more intriguing. Since discovering that her mother is not only alive, but she's the leader of traitors to the Crown, she hasn't quite recovered from the shock. Xandra is someone who would protect another to the death, just for the fact that they're blood related, but she doesn't quite have that mentality when it comes to her mother. I thought it was sad that Xandra doesn't have the strongest relationship with either of her parents, but it doesn't change how powerful or thoughtful she is. She's one of those characters that make you believe she's more than the figment of a brilliant author's imagination, a character you could could on to have your back when life gets too rough. I love the direction this series is going. Locke knows how to keep you interested in a world that's so different from our own with great characterization and suspenseful storytelling. When I think of the Immortal Empire series I think of fantasy with a edgy twist and an unpredictability that keeps shocking and intriguing me. I am waiting in strained patience for Long Live the Queen! This book sounds really interesting and I love the cover art!